Are you worried about preparing for your senior years? This forum aired on Sunday, November 30, 2014 at 7 p.m.
As the baby boomer generation ages and people live longer, individuals and communities are considering how to accommodate the elderly population. Financial advisers encourage us to save for our retirement, but a lot of other kinds of planning should be done as well. Where will you live? What kind of health care and personal assistance will you need? Since communities in upstate New York have larger proportions of seniors than some other regions, these issues have even greater impact here. Are governments prepared to cope with the impact on health care, transportation, technology and housing? And how can seniors make sure they get the most out of their golden years mentally and emotionally? 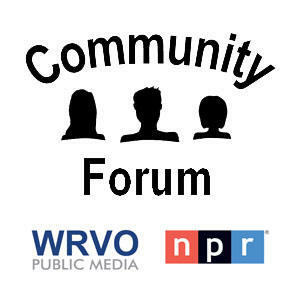 The forum was broadcast on WRVO Public Media on Sunday, November 30 at 7:00 p.m. You can listen to the forum by clicking the play button below. This forum was recorded at the Tompkins County Public Library in Ithaca, N.Y. in September. Dr. Karl Pillemer is a professor in human development and gerontology in medicine at the Weill Cornell Medical College. He is an internationally renowned gerontologist, directing the Cornell Legacy Project at the Bronfenbrenner Center for Translational Research, and author of the book "30 Lessons for Living: Tried and True Advice from the Wisest Americans." Dr. Bill Thomas is a physician, author and health care provider. An international authority on elder care, he is best known for his health care system innovation, and as the founder of a global non-profit (The Eden Alternative) which works to improve the care provided to older people. He is the creator of "The Green House," a new approach to long-term care for seniors. He also developed the Senior ER model of care. Martha Stettinius is an author and caregiver advocate. She wrote the critically-acclaimed book "Inside the Dementia Epidemic: A Daughter's Memoir" about her experience being the primary care provider for her mother. She speaks and consults widely on caregiver issues. Catherine Loper, news director at WRVO, moderated the forum. As Americans are living longer and longer, the question arises – how do you want to live your life in your senior years? This week on “Take Care,” we interview Ron Pevny, a counselor, psychotherapist, and the founder of the Center for Conscious Eldering in Durango, Colorado. Click 'Read More' to hear our interview with Ron Pevny. At the beginning of life, parents generally take care of children. But later in life, many adult children find that they become the ones who must take care of their parents. Whether that transition happens suddenly or slowly over the years, it can be difficult because the roles parents and children have played for decades are reversed. This week on “Take Care,” Dr. Leana Wen, an emergency physician and director of patient-centered care research at George Washington University, discusses some of the things adult children should keep in mind as they become caregivers. Click Read More to hear our interview with Dr. Wen. With an aging population, elder abuse is becoming more prevalent across the country and in central New York. Financial abuse has become one of the most common ways people take advantage of older Americans. Jenny Hicks runs a program out of Vera House in Syracuse that focuses on elder abuse, and says there’s a kind of déjà vu in an agency that for years has counseled victims of domestic violence.